Transnational organized crime likes opportunities and little resistance. Bolivia currently provides both and finds itself at the heart of a new criminal dynamic that threatens national and citizen security in this landlocked Andean nation. This new criminal dynamic centers on the changing patterns of drug consumption in the region. Mexico’s dominance in the regional drug trade owes much to its position alongside the world’s largest drug consumer, as well as its ability to produce drugs like heroin, marijuana, and methamphetamine. Bolivia now sits alongside the second biggest consumer of illegal drugs in the world: Brazil. Bolivia also borders the world’s principal producer of cocaine, Peru, and South America’s primary producer of marijuana, Paraguay. Meanwhile, Argentina is experiencing ballooning domestic drug consumption, particularly of “basuco” or “paco,” a form of crack cocaine which can be produced in Bolivia. Even the domestic drug markets in Chile and Peru are growing. Bolivia is now literally at the heart of South America’s illegal narcotics trade. Add to this the fact that Bolivia also produces its own cocaine and you have a plethora of criminal opportunities. This dynamic in South America is totally independent of the traditional drug trafficking routes that feed the US market. Indeed, US sources consulted by InSight Crime stated that the chemical analysis of cocaine seizures in the United States show that only five percent of drugs can be traced back to Bolivia. These dynamics alone could turn Bolivia into a drug trafficking hub, but there other reasons why this nation is such fertile ground for transnational organized crime (TOC). (See 10 Reasons Why Bolivia is a Potential Haven for Transnational Organized Crime). It is important to note that Bolivia, with a murder rate of 11 per 100,000 inhabitants, is a safe nation by Latin American standards. President Evo Morales’ government has registered significant success in the struggle against drug trafficking, principally in the control of coca crops. Nevertheless, the resources currently being deployed by the Bolivian state against TOC — pitched against those potential profits in the drug trade — make for an uneven contest. Bolivia once had its own major league drug syndicates. The most notorious was run by Roberto Suarez, who was known as Bolivia’s “king of cocaine” and worked with Pablo Escobar and the Medellin Cartel. Today, organized crime in Bolivia is mainly limited to criminal clans, engaged in a wide variety of criminal activities, principally smuggling. Those clans involved in the drug trade tend to work up to the level of coca base production. According to a senior Bolivian police source, the most sophisticated of these clans can put together up to 1000 kilograms of coca base, and deliver them to Brazilian organized crime syndicates. This coca base, or cocaine paste, then feeds the “basuco” market. Basuco is like crack cocaine, a highly addictive form of the drug which is smoked. It is cheaper to produce than cocaine and has short-lived but intense highs, prompting addicts to engage in repeated and prolonged use, which ends up permanently damaging the user’s health. Like the crack epidemic in the US in the 1980s, which gave rise to the war on drugs, Brazil, and to a lesser extent Argentina, are now struggling to contain the growing number of basuco users. Bolivia is the major supplier to both these nations. Ichilo, in the department of Santa Cruz, is one of the centers for coca base production, home to at least four of the more sophisticated drug clans. In an interview with the Bolivian TV program “Sin Letra Chica,” a member of one of these clans said that his organization worked alongside another, and that between the two they had 600 members. In a good week the two clans produced up to 800 kilos of coca base, he added. Part of this coca base was transported to the Brazilian frontier and sold directly to Brazilian organized crime syndicates; another part was bought by Colombians, who process the base into cocaine. The source also made it clear that the police colonel in the nearby town of Yapancani was on the payroll of the drug traffickers. (For more of this interview, see Voices from Bolivia’s Underworld). There is remarkably little violence between Bolivia’s criminal clans, partly because their activities attract such little attention. Unlike the Colombians, and increasingly the Brazilians, Bolivian organized crime prefers to resolve its differences peacefully. This may partly be explained by the strength of Bolivia’s indigenous culture, which abhors violence, and seeks to find communal solutions to any problems. However, there is evidence of rising drug-related killings in Santa Cruz, although this may be more linked to TOC than disputes between Bolivia’s criminal clans. The United Nations Office on Drugs and Crime (UNODC) has warned that an increase in violence is almost inevitable if Bolivia maintains its position as a drug transit and production nation. In March 2013, the governor of Santa Cruz called a state of emergency to contain a crime wave in the city, blaming violence on the drug trade. The issue again hit the headlines in July this year when there were five assassinations in Santa Cruz in the space of two weeks, allegedly involving Colombian TOC. In 2013, 762 gangs were registered in Bolivia according to the National Citizen Security Observatory (ONSC). The majority were concentrated in La Paz (261), Santa Cruz (169), and Cochabamba (106), with over 25,000 members throughout the country. Some of these are simply street gangs; others are better categorized as criminal clans. There have been two developments in the evolution of transnational organized crime in Latin America that are now having a direct impact on Bolivia. While the Colombians have had an interest in Bolivia for more than four decades, the nature of that interest has changed over the last decade. Pablo Escobar used to fly aircraft filled with Bolivian coca base and even cocaine into Colombia, before the drugs were sent onwards to the world’s primary market, the United States. Today, it is not the Colombians who dominate the US cocaine market, but rather the Mexicans. Indeed, in many cases the Colombians have turned into wholesale suppliers for the Mexicans. While in the days of the Medellin Cartel, the Colombians produced a kilo of cocaine for around $2000 and sold it in the US for $50,000, today most of the profits go to the Mexicans. A kilo of high-purity cocaine costs around $3000 in Colombia. The Mexicans are buying that same kilo for between $8000 and $12,000 from Colombians in the principal handover point, Honduras. This means that Colombian organized crime is, at best, earning around $7000 a kilo, once transport charges have been subtracted. The risks of interdiction are high, along with the chances of being extradited to the US. 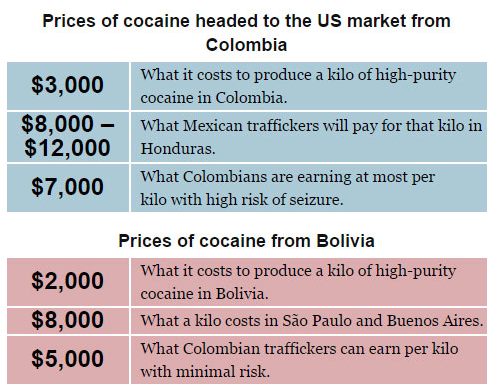 In Bolivia, the Colombians can produce a kilo of high-quality cocaine, using Peruvian base, for less than $2000. That same kilo in São Paulo or Buenos Aires is worth as much as $8000. Thus, the Colombians can earn more than $5000 a kilo with minimal risk of interdiction and almost no risk of extradition simply by moving drug consignments across the Bolivian border into Brazil or Argentina. These two nations also act as transshipment points for the most lucrative markets of all: Europe and Asia. Here is where the Colombians are concentrating their efforts. In Spain, or Holland, the principal ports of entry in Europe, a kilo of cocaine is worth around $40,000; in the United Kingdom up to $50,000; in Russia, up to $80,000, while in Tokyo, that same kilo could earn as much as $100,000. Today, Colombian TOC is producing high-purity cocaine in Bolivia, moving shipments into Brazil and Argentina, where a percentage of the load is sold before being transported on to Europe or Asia. The Colombians are still pioneers in the international drug trade, and business logic now states that the US market is no longer that profitable for them, dominated as it is by the Mexicans who earn the lion’s share from trafficking a kilo of cocaine. Thus, Bolivia has become infinitely more attractive for Colombian TOC. Another development that has impacted Bolivia is the so-called “cockroach effect.” When the lights are turned on in a room, the cockroaches scurry for the dark corners. Organized crime acts much in the same way. The lights are on in Colombia, and the drug barons, once identified, have a rather short shelf life there, and thus are moving abroad. Bolivia has yet to find the light switch. While Colombians are often captured during raids on drug-producing laboratories in Bolivia, Bolivian police have yet to dismantle any large Colombian criminal structures. An interview with a top level Bolivian police officer, who for political reasons preferred to remain anonymous, revealed that there were three principal Colombian networks. The oldest has its roots in a paramilitary group of Colombia’s Eastern Plains, the Peasant Self-Defense Forces of Casanare (Autodefensas Campesinas de Casanare – ACC), once led by Hector Buitrago, alias “Martin Llanos.” Buitrago sent some 300 paramilitaries to Bolivia at the end of the 1990s. Bolivian police arrested his cousin, Carlos Noel Buitrago Vega, alias “Porremacho,” in Santa Cruz in June 2011. Hector Buitrago was arrested in Venezuela in February 2012. More recent arrivals include Colombian traffickers from both the Rastrojos and the Urabeños, currently two of the most powerful TOC structures in Colombia. There are indications that Colombian “oficinas de cobro” (“collection offices”) have been set up in Bolivia. An oficina de cobro is a criminal structure used to monitor and regulate cocaine trafficking. The first oficina de cobro was called the “Oficina de Envigado,” a structure founded by Pablo Escobar of the Medellin Cartel. He used the Oficina de Envigado to monitor Medellin’s underworld and ensure that all traffickers paid their share to “El Patron.” Escobar’s oficinas collected the payments from traffickers and any other outstanding debts and when necessary hired the “sicarios”, or assassins, to carry out the murders of those who refused to pay or offended Escobar in some way. The model came to dominate the Medellin underworld and was exported across Colombia via the paramilitary army of the Self-Defense Forces of Colombia (AUC). The AUC ran most of Colombia’s drug trade from 1997 to 2006, when it demobilized. Colombian organized crime has now set up oficinas de cobro in Panama, Honduras, Costa Rica, Argentina, Venezuela, Ecuador, Peru, Spain, and Bolivia. In July, Bolivia police captured Alicia Lorena Vargas Muñoz, alias “La Mona,” a Colombian accused of running an oficina de cobro in Santa Cruz, linked to a series of drug-related murders in the city. After the Colombians, the second most powerful TOC groups operating in Bolivia come from Brazil. Due to the difference in language, and perhaps culture, Colombians do not have the same criminal networks in Brazil that they have in say, Argentina. Brazilian groups feed the booming Brazilian drug market, and to secure supplies of both cocaine and its derivatives (as well as marijuana) Brazilian TOC has established a permanent presence in Bolivia and Paraguay. The most powerful Brazilian TOC are the First Capital Command (Primeiro Comando da Capital – PCC) and Red Command (Comando Vermelho). Founded in the brutal Brazilian prison system, these gangs now control much of the drug sales in Sao Paulo and Rio de Janeiro and have spread out across Brazil. They have made the leap into transnational organized crime, and in Bolivia are based primarily along the border in the departments of Beni and Santa Cruz. In January and March 2013, two different cells of the PCC were dismantled in Santa Cruz, which then-commander of Bolivian anti-drug police Colonel Gonzalo Quezada described as composed of “high-level emissaries” from the Brazilian group, sent to supervise the purchase and transport of drug shipments. 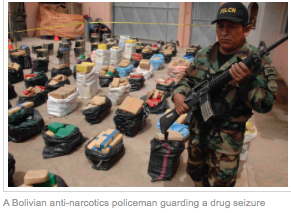 Bolivia’s importance as a transnational hub for drug trafficking is likely to solidify. The drug markets in South America for cocaine and its derivatives are growing and diversifying. Drug production in Peru and Bolivia is unlikely to undergo massive change in the near future. Peru is stepping up its crop eradication and planning to install some radar controls along its frontier, while the US is poised to increase its anti-narcotics aid to the country. This is likely to have a significant negative impact on Bolivia. While Morales has had success in containing coca production in Bolivia, should the supply of cheap and high-quality coca base from Peru go down, the pressure by drug traffickers for product within Bolivia may increase substantially. Morales’ re-election means that the current state of relations with the US is unlikely to change. Now, not only is there no DEA presence, but as of mid-2013 the Bureau of International Narcotics and Law Enforcement Affairs (INL) and USAID have also left. While Bolivia is now leaning on the European Union and Brazil for counternarcotics aid, neither of these have the experience, resources, or data to begin to fill the void in strategic intelligence once supplied by the US. Bolivia’s challenge is to strengthen its institutions and law enforcement capacity enough to provide enough resistance to TOC, so that it looks elsewhere to establish its operations. Without a radical change in Morales’s strategy, and a huge investment in resources, this is unlikely to occur. TOC is already in Bolivia, and the longer it is able to put down roots, the more likely it will penetrate state institutions. There is already evidence that this is happening in Santa Cruz, in both the city and department. The city is becoming a larger and more sophisticated metropolis with some 1.5 million inhabitants and is growing fast. Santa Cruz is developing high-quality hotels, restaurants, night life and luxury apartments, all the elements senior drug traffickers find attractive in an operating base. While top-level traffickers still prefer to reside in Buenos Aires, particularly Colombians, Santa Cruz is nevertheless booming. This could change the city from its current position as a center for negotiating the purchase and transport of drug consignments, to an attractive place of residence. If senior narcos take up residence here, they will not only accelerate the corruption of law enforcement and legal institutions, but will likely seek to influence the political arena as well. It must be remembered that the Mexicans started out in the cocaine business as transporters for the Colombians. Today they dominate the US cocaine market. The longer that Bolivia remains a drug production and transshipment nation, the more likely it is that Bolivian organized crime groups will evolve into sophisticated transnational organizations. Without significant investment in the fight against drug trafficking and TOC, the prognosis for Bolivia can only be pessimistic. Bolivia is dangerously following the steps of Somalia and Afghanistan… the coca grower caudillo who took control over all the powers of the state, rules! This entry was posted in Bolivia, Crime and Violence, Drug war - narcotraffick, Politics, Social Unrest and tagged anarchy, cocaine, cocaine production, corruption in public office, demagogue, Ochlocracy, police and judicial corruption, violence. Bookmark the permalink.